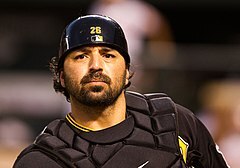 Rodrigo Richard "Rod" Barajas (born September 5, 1975) is a Mexican-American former professional baseball catcher. He played in Major League Baseball (MLB) for the Arizona Diamondbacks, Texas Rangers, Philadelphia Phillies, Toronto Blue Jays, New York Mets, Los Angeles Dodgers, and Pittsburgh Pirates. Barajas also played for the Mexico national baseball team. He is the current bench coach for the San Diego Padres. Barajas was originally signed by the Arizona Diamondbacks as an amateur free agent on December 23, 1996. He was immediately sent to the minor leagues. He played for the Lethbridge Black Diamonds of the Pioneer League (Rk), the lowest level of the minors as a rookie, but excelled, hitting .337 in 51 games. He played his way to the top of the minor leagues in the Diamondbacks' system. Barajas made his Major League debut for the Diamondbacks on September 25, 1999, against the San Francisco Giants. He was hitless in three at-bats in that game. He hit his first career home run in the last game of the season on October 3, 1999, against the San Diego Padres, a line-drive to left-center field off of Heath Murray. He played in a total of 10 games with the Diamondbacks in 1999 and 2000. He homered twice and did not commit a single error while playing catcher. Barajas struggled at the plate in 2001, hitting just .160 in 51 games, though he only committed one error while serving as a backup for Damian Miller. He was on the Diamondbacks' World Series roster. In Game 5 of the World Series, he homered off Mike Mussina of the New York Yankees. Barajas continued to serve as a backup for Miller in 2002. In 70 games, he hit .234 with 3 home runs and 23 RBI. Despite the poor offensive numbers in 2002, Barajas did not commit a single error behind the plate. In 2003, he pulled off similar numbers in 80 games, batting just .218 with 3 home runs and 28 RBI. He became a free agent after the season. Before 2004, Barajas had never played more than 80 games, hit more than three home runs, or batted higher than .234 in a full season. In 2004, the Texas Rangers invited him to spring training and he won the backup catcher's job. After starting catcher Gerald Laird was sidelined with a sprained thumb, Barajas took over the starting job with Laird and Danny Ardoin serving as his backups. At the end of the season, he established career highs in games played (108), home runs (15), RBIs (58), and batting average (.249). Barajas also played some first base when needed, compiling ten career games there as a defensive replacement, through the 2007 season. In 2005, he hit a career-high 21 Home Runs, serving as the starter once again. In 2006, his numbers dropped significantly and he split time with Laird. In November 2006, Barajas was originally going to sign a deal with the Toronto Blue Jays, but he backed out of the deal at the last minute, after switching agents. On December 18, 2006, it was announced that he had reached an agreement with the Philadelphia Phillies for a one-year deal worth less than half of the Blue Jays' offer a month earlier. Barajas claimed he was happy with the new deal and had no regrets. He shared time behind the plate with Carlos Ruiz. On October 11, 2007, the Phillies declined his option making him a free agent, and on January 24, 2008, Barajas signed a deal with the Toronto Blue Jays, the team he backed out of a contract with the previous off-season, this time as the backup to incumbent catcher Gregg Zaun. Zaun had signed a two-year deal with the team only after negotiations with Barajas fell apart. Blue Jays general manager J.P. Ricciardi said he had no hard feelings towards Barajas. Zaun was supposed to be the starting catcher, but due to his poor offensive numbers and overall difficulties, manager Cito Gaston made Barajas the starter after he took over for John Gibbons. He took over the starting catching job from Gregg Zaun, and continued in that role in 2009. He finished the 2008 season batting .249 with 11 home runs, 49 RBIs, a .294 on-base percentage, and a .410 slugging percentage over 104 games. Barajas finished the 2009 season batting .226 in 125 games with 19 home runs and a career high 71 RBI. 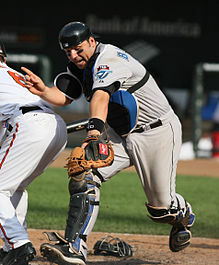 On February 24, 2010, Barajas signed a one-year, $1 million contract with the New York Mets and was named the opening day catcher. On May 7, 2010, he hit the first walk-off home run in the history of Citi Field, giving him three multi home run games in his first five weeks as a Met. Barajas became the first Met catcher to hit 12 or more home runs since Mike Piazza's last year with the Mets in 2005. On August 22, 2010, Barajas was claimed off waivers by the Los Angeles Dodgers and acquired for cash considerations. In his first game with Los Angeles against the Milwaukee Brewers, Barajas hit two doubles and a three-run home run. Barajas became the first Dodger to hit three extra-base hits in his first game with the club. In his first home game in Dodger Stadium, Barajas hit a home run in the fifth inning. Barajas appeared in 25 games with the Dodgers in 2010, hitting .297 with 5 home runs and 13 RBI. On December 3, 2010, he re-signed with the Dodgers on a one-year deal for 2011. 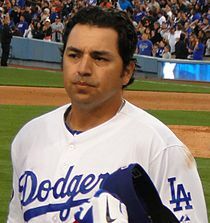 In 2011, he played in 98 games with the Dodgers, hitting .230 with 16 home runs and 47 RBI. He became a free agent after the season. On November 10, 2011, Barajas signed a one-year contract with a club option for 2013 with the Pittsburgh Pirates. The Pirates declined his 2013 option on October 31, 2012. On February 8, 2013, Barajas signed a minor-league deal with the Diamondbacks., but the Diamondbacks released him on March 25. Before the 2014 season, Barajas was named Manager of the Arizona League Padres. Barajas replaced Jamie Quirk as the manager of the San Antonio Missions on 17 June 15 after Quirk was promoted to coach at Triple-A El Paso. Due to the game being postponed to rain, his debut occurred with a double-header on 18 June 15 against the Midland RockHounds. He was later the manager for the El Paso Chihuahuas AAA baseball team. In October 2018, he was named as the bench coach for the San Diego Padres. Barajas is of Mexican descent. His mother and father are from Michoacán and Baja California, respectively. He and his wife Stacie have four sons, Andrew, Bryce, Rod Jr. and Jace, and three daughters, Aunalilia, Aubrielle, and Starlette. Rod attended Santa Fe High School, Santa Fe Springs, California and Cerritos Community College.He lived in Norwalk, California for most of his childhood. ^ "Jays sign Barajas to one-year deal". MLB.com. Retrieved September 17, 2008. ^ "Dodgers Blog". Los Angeles Times. August 22, 2010. ^ Drellich, Evan (August 30, 2010). "Kuroda flirts with no-no in Dodgers' victory". Los Angeles: MLB.com. Paragraph 9. Retrieved August 30, 2010. Rod Barajas, 0-for-9 in his career against Halladay and a Dodger for less than a week, caught the near no-hitter and hit a fifth-inning solo homer in his Dodger Stadium debut. Barajas grew up in nearby Ontario, Calif.
^ Singer, Tom (October 31, 2012). "Pirates exercise Alvarez's option, decline Barajas'". MLB.com. Retrieved November 3, 2012. ^ Bennett, Keith (May 5, 2010). "Arizona Immigration Law Critcized By Mets' Rod Barajas". bleacherreport.com. Bleacher Report. Retrieved February 25, 2018. ^ "Notes: Germano eager to face Phillies Let go in Spring Training, Padres righty enjoying solid '07". MLB.com. Retrieved September 17, 2008. Wikimedia Commons has media related to Rod Barajas.